Bring colour to your Christmas decorations with this Stained-Glass style star which has been made in Fair Trade conditions. Fair Trade Hand crafted star hanging decoration complete with a white hanging ribbon. 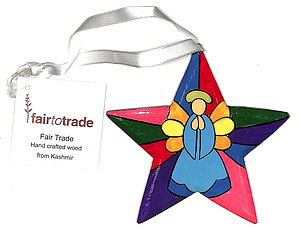 Each side of the wooden star features a colourful hand-painted angel and stained glass style design. Hand crafted by skilled artisans in Kashmir under recognised Fair Trade conditions. 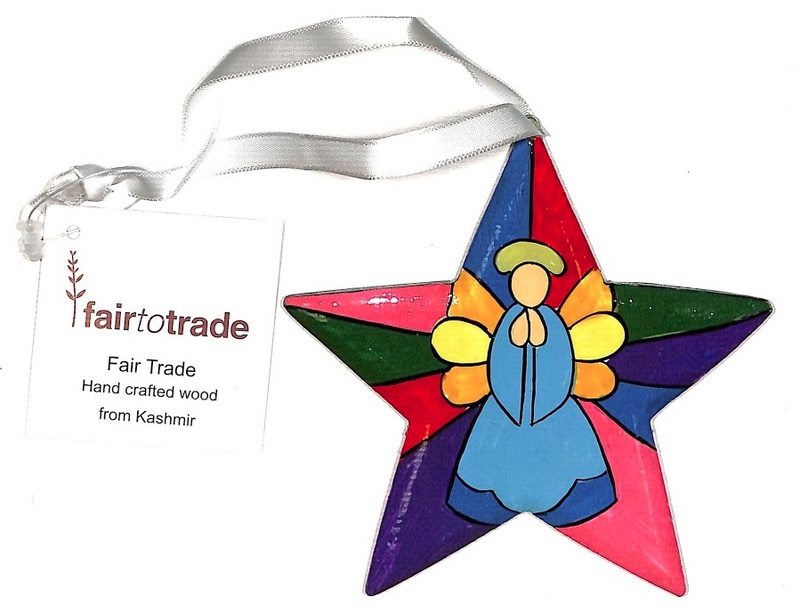 Star Decoration - Stained Glass / Angel design was published by Fair To Trade in September 2015 and is our 3071st best seller. The ISBN for Star Decoration - Stained Glass / Angel design is 5060157852964. Be the first to review Star Decoration - Stained Glass / Angel design! Got a question? No problem! Just click here to ask us about Star Decoration - Stained Glass / Angel design.